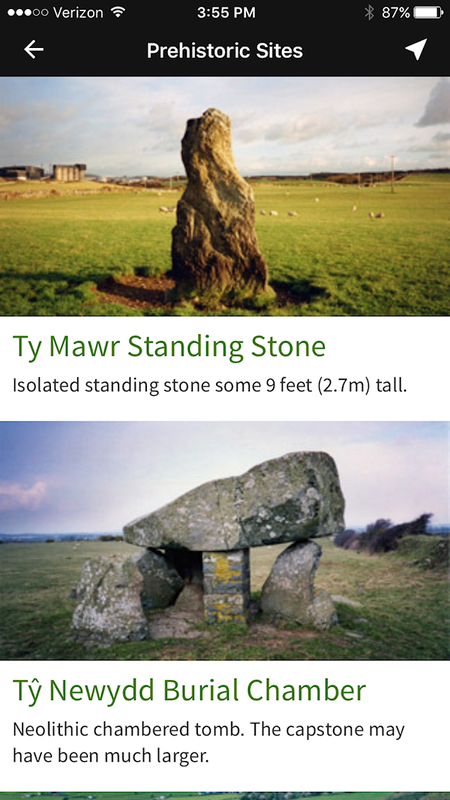 CADW mobile app: http://cadw.gov.wales/cadw-mobile-phone-app/ Compatible with iOS and Android. Available for download (free) via Google Play and Apple App Store. The Welsh Government's historic environment service, Cadw (Welsh: 'to keep, protect'), released a mobile app in early 2016 so that members of the public can learn about and plan visits to heritage sites cared for by Cadw. 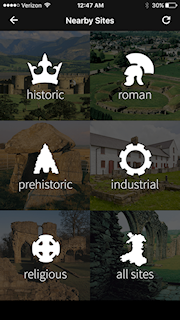 With more than one hundred archaeological sites available for browsing, conveniently ordered by spatial proximity to the user, and with a clean and accessible user-interface, the app effectively showcases the richness and distinctive character of Wales's archaeological record. The software provides basic information about each site and how to visit it, as well as more in-depth information for select locations. It is kept up to date with content related to current heritage events in Wales. 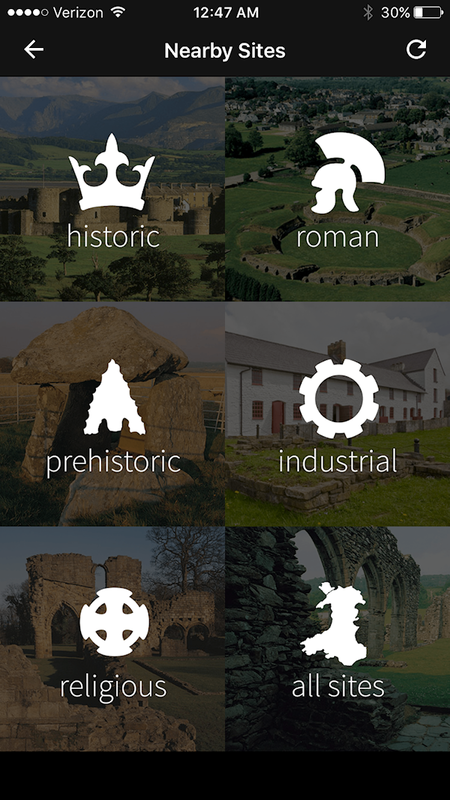 For certain featured sites, the Cadw app offers an augmented visitation experience through the use of cleverly placed beacons that send educational content to a user's phone when in close spatial proximity. The audio, video, and image files that appear give historical information about the site and enhance the place's physical reality with digital content. The app is free and available to download for both iOS and Android devices (from Apple's App Store and the Google Play Store), and is also well signposted on Cadw's website. The Cadw mobile app homepage is simple and clean, with five options given for content to explore – 'Nearby Sites', 'Sites Map', 'Nearby Events', 'Visit', and 'Digital Trails' – each overlaid onto a striking image of an example of Welsh cultural heritage (Figure 1). The central structuring component is a database of heritage sites, accessed through the Nearby Sites tab. Sites are organised into five categories – three of them temporal (Prehistoric, Roman, and Historic), two thematic (Religious and Industrial), plus a General category for searching the entire database (Figure 2). When the user selects a category, heritage sites appear in a scrolling list ordered by proximity to the user's current location, each displayed with a high-quality photograph, the name of the site and a one-sentence description (Figure 3). Although these site lists are unfortunately not searchable, they can be ordered alphabetically through the settings menu, which does give the user a degree of control in finding individual places. Tapping on a site name will take the user to its individual record, which contains a variety of information useful for potential visitors (including entry times and prices, driving directions, and a list of facilities and accessibility information), a Google Maps window showing its location, and links to two or three additional nearby sites (Figure 4). As the app is targeted at potential visitors, the records contain details that may be of interest to users with a variety of needs, such as individuals in wheelchairs, families with children, and dog-walkers. Admission times are listed by season and day, and different admission prices are listed for adults, families, seniors, students, children, and disabled visitors. The inclusion of links to other site records enables more intuitive navigation between records than the scrolling list does; it allows users to jump from place to place based on spatial proximity, as they might do when they actually visit the sites in person. Site records can also be accessed through use of the Sites Map tab, which overlays a layer of Cadw sites onto Google Maps (Figure 5). This tab can be accessed from the homepage or through individual site pages. The Nearby Events section works in much the same way as the Nearby Sites tab, providing a scrolling list of events by title, image, date, and site name. Each event then has its own page with a short description, and a link to the record for the site hosting the event (Figure 6). The events listed are current and up-to-date, and they match well with those currently being advertised on Cadw's main website, a feature no doubt made possible through the app's ability to check the Cadw website and update its information. The Visit tab brings the user to a page of general information about visiting Welsh heritage sites, including details about safety, accessibility, security, and how to contact Cadw. Conveniently, the latter can be done instantly by tapping an email or phone button at the bottom of the page. The app also contains a tab for a few specially created 'Digital Trails' – small content packages relating to specific heritage sites that are available for download. Each digital trail is a tour combining audio content, historical images, and artistic renderings, which work together to share facts and tell stories about the site. Much of the audio content consists of stories told by historical or imagined figures at the sites (e.g. castle lords, musicians, inventors, etc. ), which serve to create an immersive experience. Once downloaded onto a user's phone, a digital trail can be accessed without an Internet connection, and is designed to be used at the site it describes, adding a degree of historical richness to the experience. These tours are not intended to replace paper guidebooks and trails, but simply to add an extra layer to the experience. For 2016, Cadw created tours for Beaumaris Castle, Denbigh Castle, and Raglan Castle. Although the tours can be downloaded anywhere in the world from the Digital Trails tab, they are designed to appear automatically when phones are close to one of the featured sites. As the user walks around the site, the app interacts with hidden, strategically placed iBeacons (Apple Inc. devices that transmit a UUID to nearby mobile phones). Proximity to a beacon will trigger the app to reveal a new piece of content of the type described above that relates to a specific area or feature of the site. This enables unobtrusive and interactive communication of information that obviates the need for display boards or traditional audio guides, which might interfere with the atmosphere of the site. The beacons, made by Welsh company GCell, are designed to last at least twenty years and are mostly waterproof. Their placement locations were made with both user experience and site presentation in mind- beacons are situated as unobtrusively as possible, while avoiding damage to historic buildings. They are also occasionally attached to people (i.e. volunteers and enactors), which encourages visitors to interact with these individuals, leading to a more immersive experience overall. At the moment, the range of some of the beacons is a bit of a technical issue, with their signal either struggling to reach mobile devices at the appropriate locations or extending farther than is desired, but Cadw is in the process of manually resetting their ranges to optimize efficacy. The interactive nature of the features is largely intended for the general public, but the idea of reviving, reinterpreting, and re-placing aspects of these sites using augmented reality is also of great interest to archaeologists as we consider themes of multi-temporality, performance, and even multi-vocality. The digital trail at Beaumaris Castle has been featured several times in the popular press for how it visualises the likely appearance of the castle had it ever been finished and for the audio segments containing imagined perspectives from the castle's workers (see BBC and ITV reports). It therefore presents not just the castle's past, but even some of its imagined futures. This app was designed using the Locly Native app creation platform, a development platform that can build for both iOS and Android, and is able to interact with various location services including iBeacon. This was particularly important for the creation of the Digital Trails section of the app, which relied on such technology. By partnering with Locly, Cadw could focus on their app's content rather than on designing their own software from scratch, taking advantage of the company's existing knowledge and technology. Additionally, Locly professes to include a user-friendly content management system through which their clients can update and add to their app's content after its initial launch, thus minimising the need for ongoing, in-house technological expertise at Cadw. As is expected from a Welsh Government product that aims to be highly accessible, users of the Cadw app can view content in either Welsh or English; even its description on the iTunes App Store is bilingual. When opening the app for the first time, the user selects between the two languages. This selection is remembered for future sessions but can be changed in the settings menu. Contact information (telephone numbers and links to online resources) is interspersed thoroughly throughout the app, which is another way in which Cadw's project has succeeded. Additionally, the site descriptions are short, clear, unambiguous, and, in the case of some sites, even funny. For example, the entry for Raglan Castle says, 'Raglan was built in the 1430s, rather late in the day for castle building. Unfashionably late by some 150 years!' Simply giving the castle's date of construction would have been sufficiently educational, but would not have been nearly as engaging. These brief blurbs are entertaining and easy to process, and they make browsing through the various entries effortless and fun. The user interface, which uses the same UI template as several other Locly apps, is slick and professional. This is partly due to the aforementioned incorporation of high-quality photographs of monuments and buildings. However, the clean and clear look is also affected by more subtle design choices, such as the font, inclusion of blank spaces, and the standardisation in the presentation of select types of data in clearly ordered sections. The images, which take up more than three-quarters of each record in the Nearby Sites list, effectively work as advertisements for the sites, which then contain more information on their individual pages. The Cadw app's elegance extends beyond the user experience to the development process and daily maintenance of the software. The current instantiation builds off of two pre-existing programs: an earlier version of the Cadw site database, which has been available in mobile form for the past half-decade, and National Museum Wales' Culture Beacon app. By relying on these antecedent frameworks, Cadw were able to develop their app both quickly and cheaply. In total, the development time was less than one year and the cost was less than £5000. An added benefit of piggybacking onto the Culture Beacon app is that users of each app are able to access content from the other, expanding the amount of available content beyond Cadw's main sites database and beacons. The Locly development platform simplifies the management of the app's content, such that it can be maintained primarily by one person—Erin Lloyd Jones, Cadw's 'Heritage Interpretation Manager'—who keeps the site, beacon, and event information current. Additional people are involved with marketing, some content creation, and hosting of the app. The augmented reality provided by the iBeacons is the most innovative aspect of this app, and the developers were careful to take local considerations into accounts in its implementation. The use of the beacons enables seamless location-specific content without relying on either public Wifi (which is not present at most sites) or network data (which may be expensive for visitors, if it is present at all). Additionally, the beacons keep a record of when they successfully communicate with mobile devices, which allows Cadw to run analytics on which beacons are most and least visited, how much time visitors spend at each one, etc. This, in turn, can influence future beacon placements. Over the next few years, Cadw is looking to expand the Digital Trails feature to increase its ease of use and to draw interest from a more diverse subset of the population. Their plans include enabling bulk downloads of Digital Trails packages (e.g. all castles, northwest Wales, etc. ), providing tablets to site visitors who don't have smartphones or who are travelling from overseas, using data gathered by the beacons to recommend sites to users based on their past visits, and potentially adding a gaming element to the app, following the Pan-Wales Heritage Interpretation Plan. Cadw define themselves as 'working for an accessible and well-protected historic environment for Wales'. The design simplicity of their mobile app and its effective function as an advertisement for heritage sites dovetails nicely with this mission statement. The purpose of the app is not to provide detailed scholarly data and interpretations of the sites that are included, but to make people want to visit them and to provide the necessary information for doing so. By providing visitor information that addresses the differing needs of multiple audiences, the program makes it easier for all members of the public to experience Wales' heritage. This desire to communicate to diverse audiences is also evident in the digital trails packages, which contain media objects targeted at different interest groups, including some specifically aimed at young people. The database contains a variety of site types – from hillforts and standing stones to abbeys and palaces – but some kinds of site are much better represented than others. Of the 122 entries currently featured, 54 are tagged as being Historic (44.3%), of which 42 are castles. By contrast, only 4 sites in the entire database are marked as being Industrial (Pont Minllyn, Bryntail lead mine buildings, Dyfi furnace, and Blaenavon ironworks). Twenty-eight sites are Religious (23.0%); 23 sites are Prehistoric (18.9%); and 8 sites are Roman (6.6%). Five sites are not currently categorised. Although castles may have more immediate public appeal than dovecotes (1 example), hut groups (2), or town walls (4), it would be nice to see more examples of currently under-represented site types added to the app in the future. More than 70% of sites included in the database are either single structures or building complexes, and very few entries focus on archaeological landscapes. Incorporating more of a landscape perspective might better represent the complexity of Wales' cultural heritage. Representing such features with walks through the countryside or through urban environments would open the door for the creation of new, outdoor digital trails, which would nicely complement the building-specific ones already in existence. Several of Locly's other projects work on a citywide or regional scale (e.g. Tiger Bay Tales, Fron Goch, and the Nefyn Heritage Trail), so adding such trails to Cadw's app would not be unprecedented. Aesthetically, this program compares favourably with English Heritage's 'Days Out' and the National Trust for Scotland's 'Trust Trails' apps. Cadw's look is both cleaner and less hierarchically structured than its peers, which makes it easier to navigate. The three apps contain similar types and amounts of information about locating and preparing visits to heritage sites. Although Days Out and Trust Trails offer more options for finding and organising records within their databases, Cadw makes up for the lack of these services with its design simplicity and with its digital trails feature (the others have no such equivalent). The only frustrating aspect of Cadw's app is its lack of a search function. Sites can be listed alphabetically or by distance from the user (with or without period/theme categories), but there is no easy way to look up a specific record. This is compounded by the fact that it is not always obvious which period or theme category a certain site should fall under. For example, Caer y Tŵr is classed only as being Roman, despite containing both a Roman watchtower and an Iron Age hillfort, and looking for it in the Prehistoric section turns up nothing. It would be both more convenient for users and more archaeologically accurate if sites could appear in multiple period and theme lists. The total set of categories could also be expanded (e.g. to include military or agricultural sites or to separate the medieval and post-medieval periods). Overall, Cadw's mobile app incorporates elegant visual presentation with useful information for heritage enthusiasts and potential visitors to historical sites. The software is easy to use, its various components are well integrated into a coherent whole, and its records contain an appropriate amount of information for potential visitors. The app's greatest strength and most innovative feature is how it offers augmented visits to select sites through its digital trails component. In addition to being engaging and educational, these tours are a creative way for visitors of all backgrounds to interact with the past and experience it as a living entity. Overall, therefore, the app stands out as being an excellent example of how mobile technologies can serve to communicate archaeological knowledge to the public in a friendly and engaging fashion.